People watching, eating food, watching shows. Knott's, I really enjoy Knott's but Cedar Point reigns supreme for me, its just a fun park! No, luckily I didn't need to. Batman: The Ride SFMM, the best one that come to mind.
. Name 3 of your favorite roller coasters, but not your top 3. 22. Best drop tower under 150 feet? how big is a feet again? 28. Launch or Lift? LUNCH, i mean launch! 39. You can eat nothing but corn dogs, churros or funnel cake for the next 48 hours, which do you choose? DAGWOOD DOGS!! was expecting to love it. . . but it blew me away. New to me, would be Fury325. hmm. . .on a super crowded Labor Day weekend, with no Flash Pass, we waited ~80 minutes for New Texas Giant at SFOT. Under 150? StratosFear at Knoebel's was damn good. As much as I love Maverick? MF takes it. People watching, going to a show, just walking around. love both, but Launch preferred. those awful bugs at dusk at CP -- on both Raptor, and Maverick. eh. . it's a coaster. . continuous loop track, but yeah, I'll call it a coaster. 2nd row from the back on the left. Last edited by bert425 on Sun Jan 20, 2019 8:21 pm. 32. Idek maybe the Batman Clone in Spain? Last edited by Coasterwatch01 on Sun Jan 20, 2019 6:56 pm. Why install real coasters when you can ride a virtual roller coaster, on an physical coaster? Tokyo DisneySea, because it's almost impossible to have a bad day there. HangTime. Not hard to top Boomerang, but it was even better than I was expecting. Italian herb and tomato popcorn at Tokyo DisneySea. To be honest, no idea on this one. By ride layout, Raptor (CP). By theming, Fenix. Flying Fish, DisneySea (didn't get the credit last year, and I was feeling sad and pathetic). Space Mountain in the back seat. 90 minutes (standby for Dodonpa). Probably Space Mountain at Disneyland (used to go as a kid all the time when lines were walk ons). Haunted Mine Drop, Glenwood Caverns. Wish more parks could do underground stuff like that. 1. Not really going to it. 2. Not really going to it. 3. Not really going to it. Knott's Berry Farm. Especially with recent management, love that it's retained a good chunk of its original history and continues to follow that pattern. (Elitch Gardens, but even I haven't been there in a few years). Yep (Fuji-Q, Cedar Point, Knott's). Like any fandom, most people in it are generally pretty cool about it, and there there are the freaks that become the stereotypical image of [insert fandom here] and make it awkward for the casual fans. The B:TR clones. Sure they're clones, but they're still great. Attraction merchandise (if the design is good: wanted Steel Vengeance stuff, but it all looked like it was designed by an edgy 15 year old). GhostRider, I guess. I need to get to El Toro at some point to remedy this. Most recent was hail, which is not pleasant at all. I think they're a little more like Larson Loops than coasters, but I could understand if someone wanted to count one. Don't have any from 2018, sadly. The only 2018 coaster I experienced was a Larson. I'll just say Falcon's Fury. The one that comes to mind is Primeval Whirl. Maxx Force or Adventureland's Phoenix as they are the ones I am most likely to ride. Wicker Man's fire. I like fire. About 2 hours for Flight of Passage. I'm too lazy to check, but WDW's Tower of Terror is under 150, right? Carowinds. It's behind Cedar Point, above Valleyfair and Worlds of Fun. While I could easily say Valleyfair, Nickelodeon Universe is easier to give good reasons for why one should visit. -The Log Flume! How else can one ride a log flume in Minnesota in the dead of winter while the animatronics are wearing ugly Christmas sweaters? -It's located at the Mall of America. There's gotta be something you like there. Not in my college student budget. The Original Batman: The Ride. I admire your confidence that I can look great in an on-ride shot. But the fact remains that I have none. I would say The Beast for its night rides, Phantom’s Revenge because it’s near and dear to my heart, and Twister at Knoebels, which would be #1 at most parks. Tokyo DisneySea: got an unlimited popcorn pass, saw Mickey play drums, rode a gondola through Italy, ate lunch inside a volcano, and abused the hell out of the Indie single rider line. 4. Your favorite 2018 park addition (ride, food, show, etc). Flight of passage probably. I really knew nothing much about it but it’s just fun from start to finish. The whole experience. Didn’t make it out to Knoebels but likely something from Disney. Did have some decent food at Fuji Q and Nagashima but I’ll give the nod to Epcot. Eh, I didn’t ride enough new stuff honestly to pass too much judgment. 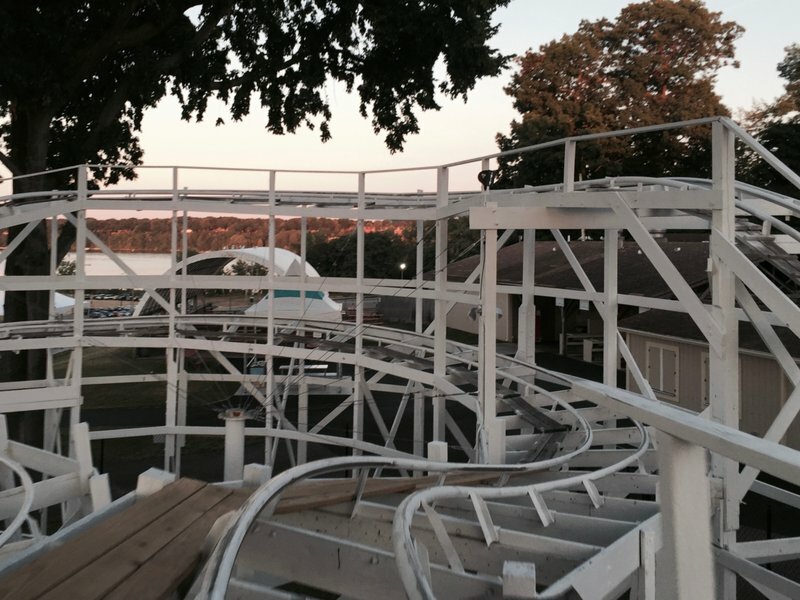 Kennywood to ride my home park’s new hotness (it it opens). Oh boy. There were certainly some lame ones out in Japan but each of those usually had some sort of ‘charm’ to them. Probably New Wild Mouse at Misaki Park. Just kind of crawled around. I would say Olympia Looping. I don’t think it’s in the cards just yet. I’m really hoping to get to Germany before it’s retired. Steel Curtain as it’s the only one I can guarantee I’ll ride if it opens. I find this difficult and kept bouncing between places here. A lot of places are just good or bad for me. I would say Delgrossos though because it has a lot going for it (nice water park and food) but really has little in the way of unique rides. It’s a really nice local park though. Space Mountain probably. I feel like I won the lottery when I sit in the front. My eyes water and I end up smiling when I hit the brake run. Haven’t done either, but I do love me Dollywood’s. Been the last couple years. Mystic Timbers was funny for me because I knew what to expect but I hyped it for my girlfriend. Six Flags America 2017. Hoping to visit Great America soon though! If one disappeared today I would likely miss Intamin more but it’s really close. I’ll echo someone else. At night, Island. Otherwise Dominion by a small margin. Probably Flight of Passage at a hair over an hour, getting in line just before park close. Oh, I’m sure it’s something at Kennywood. Likely Thunderbolt. That or Gemini which I rode 60 tines in one day at Coasting for Kids. Maverick without a doubt. Nimble and fun from start to finish. Log Flumes all the way. Splash Mountain. Enjoying a nice thanksgiving meal at the cafeteria or a golden nugget dip cone. Bringing in a picnic lunch. Family had a long history of bringing in some delicious chicken and sides and sitting under the pavilions. Enjoying or marching in the fall fantasy parade which I did in high school and college. The lights at night are just special. For me, it’s tough to decide between CP, KD, and KI 1, 2, 3. but I’ll give King’s Island #1, and then Cedar Point. The coasters at Cedar Point are definitely top tier, but the overall feel of Kings Island is better for me. As it’s probably been made clear by now, Kennywood. 1. The solid balance of old and new. The cafeteria building is nearly original to the park, Kangaroo, Auto Race, Turtles, Noah’s Ark, and the three woodies counter the new so well. 2. Pittsburgh. If you’ve never visited, there’s a reason so many folks seem to stick around. Wonderful people, a huge food and beer scene and plenty of other things to do and see. I’m a woodie fan at heart, so I’ll go lift. This is kind of tough. It would be between Hurler at Carowinds, Predator at Darien Lake, or one of the two at Canada’s Wonderland. I think it’s probably possible to be a bit of both depending on who you’re talking to. 33. Name something that you tend to take home from parks that you didn't bring with you. Maybe a pin or something. Not too much souvenir shopping for me. El Tori, though I’ve not been on it for a while. Lots and lots and lots of bugs at Cedar Point. Nope. Definitely not. I have no case. Never had one but probably yaaaas. Wild Eagle a month or so ago. Funnel Cakes but I’m not big on any of them really. From Robb’s camera on Steel Dragon, a bucket list coaster for me. Never been able to get to either. Wicker Man, never rode it, but the shed was lame. It's been awhile but SFMM in 2014. Dang...never hated a Schwarzkopf, but I'm gonna go with Intamin. Been to Island dozens of times, and Dominion only once...but I'm gotta go with Dominion. No idea, but probably Thunderbolt or Maverick. Don't follow them, or read into it, but hey they have a lot to be proud of with those parks. Dang, all of my favorites are under 110. Let's go with GhostRider. No, neither are Larson Loops. First of all, who cares what your count is as long as you're still having fun riding. I consider a credit a traditional coaster, either gravity run or launch. Haven't gotten an on-ride photo since Banshee opened. I'm lame, I know..
From what I went on....Guardians of the Galaxy at DCA. Guardians of the Galaxy. I was a little upset they changed Tower of Terror but after riding Guardians...I was so happy they changed it! I'll be honest...I didn't ride any new coaster and I didn't really keep up to date on which ones were new this year. After seeing trip reports to Energylandia, I'd have to say the coasters there look AWESOME! Batman. The super hero is themed to a bat so that means the coasters are themed to a bat and a bat is a bird that flies at night...duh! I didn't ride much but I will have to say Space Mountain at Disneyland. It was themed to Ghost Galaxy and I was very unimpressed with the crap that was inside. I couldn't see anything and the soundtrack was pretty lame. Steel Vengence because I need to get back to Cedar Point and ride ALL the rides i haven't ridden. I have no idea on all the rides coming out but the one at Six Flags Magic Mountain looks interesting. Not sure which one is which but I love Christmas Time decorations. Everyone loves fire and wood together! I enjoyed Dominion more when I went there back in 2001. Stupid YOLOcoaster at SFMM...35 minutes. Probably something at SFMM because I went there the most out of any park when I lived in California. Either Revolution (because it never had a wait and it's been there the longest) or Goliath because I remember one time I visited I rode it 10 times in a row because no one was at the park. Jumping off my roof into the swimming pool. Log Flumes every single time. I've ridden Splash Mountain when it's freezing outside! I will never ride a Skyride when it's freezing outside because you become more cold from being up in the air and open to the elements. What's a home park? I live in freaking Tucson, Arizona! My home park is technically Castles N Coasters...I've only been there 3 times and once was enough! Second favorite is Cedar Point. My favorite is Knott's Berry Farm because growing up in So Cal, I went there all the time and it has great memories! How about you give me a reason to visit your park and even if it sounds crappy, i'll still visit there instead of my "home park"
I bought Disney's MAxPass for Disneyland Resort and it was well worth the money! Mean Streak...pretty sure that coaster was the reason I pulled a back muscle the last day of the trip while lifting my suitcase to travel home. The Batman ride at Parque Warner in Madrid. If it's a credit, then every freaking carnival ride like that is a credit. The credit ho's can have them but I've stopped counting credits anyway. Depends on where. Carnivals or fairs...Hell no. A well established theme park....Hell yes!